It's official: I can't use normal cellphones anymore. Clunky user interfaces, arbitrary conventions, learning curve... They should all die. 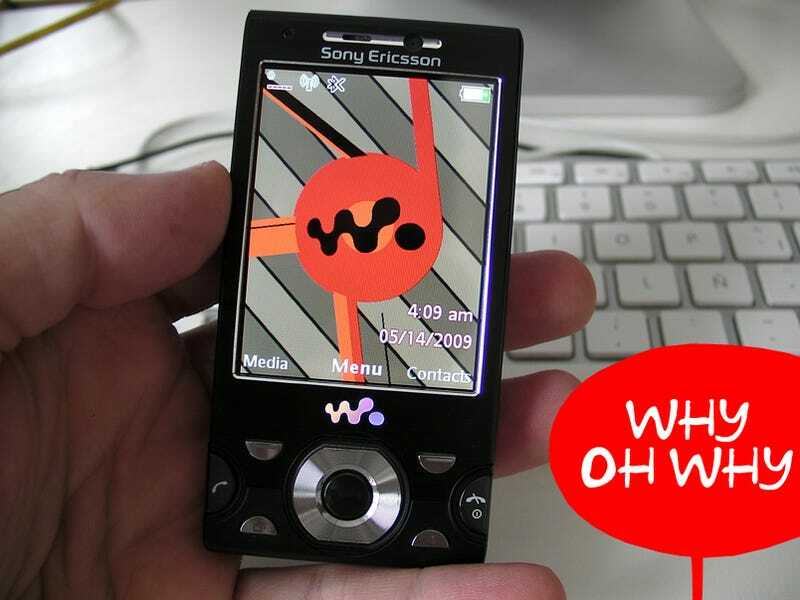 The Gadget: Sony Ericsson W995a, an unlocked Wi-Fi and A2DP-enabled 3G cellphone that puts together a 8.1-megapixel camera—with geo-tagging capabilities, face detection, flash, autofocus, and dedicated buttons—and a Walkman. The W995a is well built, feels solid. I mean, there's nothing particularly wrong with it except for the keyboard, which seems flimsy and prone to inaccurate typing. It has a beautiful screen. The media reproduction capabilities are OK. You can use physical buttons to play, pause, go forward, and backwards. And they light up! Oh the joy. OK. I'm sorry. I can't do this. The real story is that the W995a is basically the same cellphone as the first cellphone I've ever used and loved dearly: My trusty Sony Ericsson T68i. That thing and I had history, and I loved it. I loved the same matrix menu, the same convoluted user interface that makes you go through a hundred screens before reaching the place you want, and I even loved the predictive keyboard—which actually really didn't work well, but whatever. I don't mean to pick on the Sony Ericsson here, which is probably one of the best dumbphones of its kind, a totally acceptable high end specimen. No, I'm talking about the entire damn category of super expensive phones that do nothing special compared to the phones we had a decade ago. I went through other dumb cellphones after that, all the same, from Nokia, from Motorola, LG, Samsung... all these dumb cellphones have the same clunky interfaces, the same bad media handling, the same bad internet access. There were "smartphones" then too. But they weren't that smart. I had a BlackBerry, for example, that was just a glorified cellphone with a wheel and nicer mail than the rest, which didn't have mail at all. Sony and Nokia also had "smartphones." They were so happy. Fast forward to 2007. With the cellphone market already saturated with hundreds of combinations of dumbphones, Apple released the iPhone. Nokia dismissed it. Motorola too. (Motowho?) So did RIM and the rest. These "newbies" from Cupertino didn't understand the cellphone business—how could they introduce a phone? The market thought otherwise and the iPhone stole the show. People saw simplicity wrapped in good design, and even though not everybody bought it, everybody realized all of a sudden that cellphones don't have to be clunky machines full of buttons and neverending arbitrary menus. The iPhone redefined the game and people instinctively knew that, and the smartest companies followed suit. Next came Android and Palm Pre and the not-yet-released Windows Mobile 7, versions of the same basic idea: Smartphones are not about piling on the crap. Smartphones really are simplerphones which, because of that, actually can do more than dumbphones. The Real Verdict—About All Dumbphones: So my final question is: How can companies keep releasing more or less the same dumbphones from 2002 in 2009? I don't have a clue. There are 4 billion cellphones in the planet and only 10% are smartphones. That figure is rising quickly and will only accelerate as Android takes off, Pre launches, RIM tries to make a smarter BlackBerry, and Apple keeps with its plan to dominate the world with the iPhone family of products. It's no coincidence that Nokia—the largest set maker in the world—has gone from earning billions to trying to survive. It's also no coincidence that Nokia's head honcho names Apple, Microsoft and RIM as his chief competitors, and not LG, Samsung or least of all Motorola. Some will say that there should be cellphones for everyone. True. Cheap dumb cellphones for $10 a pop are great. But this thing costs $600. Other similar phones from other companies cost about the same without a contract. In 2009, I can't find any excuse to buy something like this. Click to viewDumb cellphones—like the W995a—are like the coolest, fastest typewriters in an age of word processors. And they should all die.